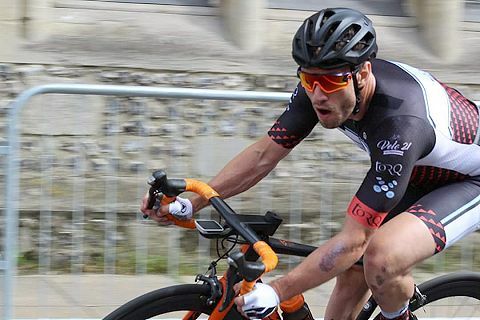 VeloUK: How did you get into the sport of cycling? VeloUK: Full time rider, student or working? VeloUK: Best result for you in 2018? Tom: Most definitely my 3rd at the European Masters Cup in Mallorca. Came after a super stressful time at work and virtually two weeks off the bike. VeloUK: Best organised/fun race you did in 2018? Tom: Tour Series in Redditch. Mega experience and gave out my first autograph. Got round. VeloUK: Toughest race of 2018? Tom: Winchester Town Centre crit which doubled as the South Regional Champs. Super technical, for me harder than the Tour Series. VeloUK: Best moment in a race or funniest moment in a race in 2018? Tom: Getting announced on the podium for the Tour Series at Aberystwyth and dishing out autographs, then casually chatting with Ed Clancy afterwards. It was a nice reminder that I’m actually just a fan of cycling who’s been lucky enough to get a chance on a bigger stage. VeloUK: Do you train alone or have others to help you get through the ride? Tom: Mostly alone these days. VeloUK: In the winter, training on the road or indoors? VeloUK: How many hours on the bike can you fit in during an average winter training week? VeloUK: Is there any off the bike training (running/swimming/gym etc)? VeloUK: Do you train with any gadgets (Heart rate/power) or just go on ‘feel’ of the ride? VeloUK: Are you eager to race again or happy to wait for the first to come along in 2019? Tom: Eager yes, but experience says there’s no point flying in January as it’s a long ol’ season! VeloUK: Are you doing anything different in training this winter than last one? VeloUK: Favourite pre race meal? VeloUK: Best one thing you learned about racing in 2018? Tom: Just chill, read the moves and trust your legs. Spent too long over-thinking it for the most part, my best results came when I relaxed. VeloUK: Favourite professional to watch on tele (male or female) and favourite race(s) you like to watch and inspire you? Tom: I’m a big Spring Classics fan, and love watching Roubaix and Flanders, plus all the smaller races. I just love the way one day classics are raced. It’d be a cliche to say I’m a big Geraint Thomas fan, but I am. I’m also a big fan of riders like Jasper Stuyven and Michael Valgren, strong guys who roll the dice in big races. VeloUK: Your bike for 2019 will be what and what’s the best thing about it? Tom: We’ve got a secret KTM weapon for this year, which is exciting. I’ve seen some pics and it looks mint.